Brings Intimacy Between Him and Us! On December 22, 2010 a friend sent me a link to a UTUBE video entitled "The Occult in the Church (discernment video)." On January 15, 2011 I was able to watch the video. It didn't take long to recognize that the meeting that was going on in the video had the occult in it, unknown to the people. Python was having a great time. I was saddened to see the deceptions taking place because I'm sure these people love the Lord no matter who they happen to be associated with. The video says who, but that is not what I'm centering on. What I was watching was far, far, far from "the Order" the Lord says He will have in His church. See You May Leave. On January 16 the Lord gave me a scene in which it was revealed that witchcraft had grown up right along with something that was good. In the scene the witchcraft was separated from the good and I was to gather the witchcraft and bring it all together. Then I was to bring the good together. After I had done this I was to bring the witchcraft and the good together, and then burn both at the same time. I pondered the scene and realized I needed to bring some things together that I already know. It would give evidence of Python and the occult in the church as a testimony. I didn't understand how or why I was to burn both the good and the witchcraft together, although burning (fire) is a cleansing symbol. I figured I’d have to walk this out and the Lord would show me what He meant. God Deals with Me Concerning an E-mail. Years ago the Lord told me I was to be a witness of what I've seen and heard, that what He shows me in the night is His judgement, not mine. So here I become a witness of the events concerning a dream and an e-mail I received on June 6, 2008. Here is the main part of the dream from my records. I walked up to a counter where there was a cash register in a place best described as a pub. I gave the lady behind the counter some change. She slid a salt and pepper shaker over in front of me. I figured she was wanting me to buy a shot of whisky but I told her that I don’t do that. She then put two small cans in front of me, with the one on my right being open. It was full of something a little off white that looked thicker than milk. The can was like a very small paint can. I said, “I’ll take that,” as it was free. I walked back into the back part of the building to see what was going on. There were men in a back room who wanted to do something to help what was going on, but they didn’t really know what to do. They were playing a game. They had a target (probably a foot wide and 6 inches tall - or the dimensions of a small billboard) sitting on a table. They were shooting paper wads at it with their fingers. One man raised the target about 10 inches off the table top and said, ”Maybe you can hit it there,” speaking to the man shooting. The target looked like a thin piece of foil with frayed, jagged-looking, uneven edges. There was evil darkness in it, like evil storm clouds. It’s hard to describe. At any rate it was evil. I awoke from the dream meditating on it, realizing some of the symbolisms because of previous scenes in the night and subjects God has dealt with me about in the past. The change I gave the cashier is easy for me to understand and pertains to the fact that through me the Lord has revealed changes the church needs to make to become spotless. I have actually given some of the change out. Secondly, I knew the Pub represents the church in the world that has spirits operating in it (The Lord said that Python is rampant in His church). Thirdly, I understood the symbolism of men playing games in church situations because of the lack of knowledge. The Lord has dealt with me through the years concerning the games people are playing in church and that is how He views it. Realizing all of this, I saw no purpose for the Holy Spirit to give me the dream other than to remind me of the condition of the church. The church doesn't really have a clue of her true condition in relation to the Lord, who is supposed to be heading the meetings. This includes main, well known ministries and people who run them, as well as those not so well known. I was wondering about all of this when I went to my office. I usually check my e-mails first and I had received the following forwarded e-mail that Andrew Strom had written. I read down through the e-mail to the third paragraph to realize the e-mail had to do with the dream I had just experienced. I read across Revivals are often messy - but they are messy around the FRINGES and knew that this was the target I had a hard time describing in the dream. The target in the dream was best described to be messy and "Messy around the fringes!" Of course I was even more intent as I read on, asking the Lord why He gave me the dream and what He wanted me to do with it. CHARISMA QUESTIONS AGAIN! - Lakeland Revival. ANDREW STROM: Charisma Editor J. Lee Grady has waded into the Lakeland controversy again this week with another interesting article. He calls it, "An Appeal for Unity in a Divisive Season". 'messiness' of Revivals: "Revival is messy. As much as we would love for it to come in a neat and orderly package, history teaches us that outbreaks of the Holy Spirit are often accompanied by holy chaos. There may be conversions and healings in one corner and demonic manifestations in the other. In seasons of revival you can have miracles and mayhem. Holiness and heresy can erupt simultaneously..."
My own comment is that - Yes - Revivals are often messy - but they are messy around the FRINGES - not at the very heart and center of what is happening. As many readers know, I have been studying Revival history for many years and I have a whole chapter on "Manifestations in Revivals" in my new book, 'True & False Revival'. But the fact is, if you have demonic deception right at the center of what is being preached or imparted, then you no longer just have a "messy" revival - you have a deadly counterfeit. True Revivals always have pure preaching of Repentance, Holiness and the Cross at the center. They bring deep conviction and the Fear of the Lord. There may indeed be weird stuff going on around the fringes, but if it is allowed to take over then a true Revival is finished. (-I give examples of this in my book). The problem in Lakeland has been that there has been a weird unbiblical 'anointing' at the very center right from the start. And it has been imparted to thousands of people. In fact, Todd Bentley has said that the whole thing is "about impartation" - and they lay hands on everyone. The "angels" factor has also been at the very center from the beginning. Angels are said to be heading up the whole movement - doing the healings, speaking to the leaders, etc. They are not a "side issue". Todd Bentley's angels are at the heart of everything. And if you look at all his past experiences with so-called 'angels', you truly have to doubt the source of a lot of this "power". Did Emma and the "financial" angels sound right to you? If they are "off" then most likely Todd is dealing with false angels all the time. As I said, we are not dealing with a movement that has problems around the "fringes" here. The problems are right at the heart - ie. they involve the central things that are being preached and imparted to people from the front. And it has been that way from the start -which is what makes this crucially different from a real Revival. I hope, Lee, that you can see what an important distinction this is? "In recent days, people who were touched in Lakeland have started similar meetings in Atlanta, Chicago, Charlotte, N.C. and other cities. Bentley and his colleagues believe this is the beginning of a worldwide healing revival that will cover the globe. "But not everyone in the charismatic/Pentecostal community is convinced. Some say this is the last end-time revival while others maintain it is a demonic counterfeit. Cult-watchers and anti-heresy bloggers post Bentley’s comments on You Tube as evidence of a theological scandal. Revival advocates respond by posting documented evidence of healings. It all begins to resemble a childish competition. "Still others worry that Lakeland represents a questionable mixture of truth and error. Since the initial eruption of the revival, my inbox has been full of messages from charismatic leaders who are concerned about weighty issues as well as trivial ones: Everything from Bentley’s tattoos and body piercings to his claim that he once interviewed the apostle Paul in heaven. "When I wrote an article in mid-May calling for scrutiny of some aspects of the Lakeland Revival, I was labeled a Pharisee and a “religious policeman.” People who said they had been deeply impacted by the Holy Spirit in Lakeland used spiritual threats and harsh terms to tell me that I had become the enemy. statement I’ve ever made about this revival I will. But what these nasty exchanges have shown me is that a divisive spirit is certainly at work in our midst—and we need urgent prayer to short-circuit what the devil wants to do. “Therefore it is my judgment that we do not trouble those who are turning to God from among the gentiles, but that we write to them that they abstain from things contaminated by idols and from fornication and from what is strangled and from blood” (v. 19-20). In other words, James affirmed the gentiles’ access to salvation and overturned the legalists’ bad doctrine. "Based on this biblical example, I am appealing to the elders in our movement. We need to hear from them in this hour. In a desperate moment we need older, seasoned veterans to release the counsel of the Lord..
"Today the charismatic movement has become fractured, and opposing camps have formed. On one side there are those in the apostolic camp who tend to emphasize biblical order, proper church government, spiritual warfare and the reformation of society. On the other side are those in the prophetic camp who focus on miracles, healing, mystical experiences and the reclaiming of all the supernatural manifestations of the New Testament. "Both of these camps are contending for valid, biblical truths. We need the prophetic and the apostolic! We need miracles as much as we need healthy church growth and societal change. Yet if we do not have a holy intervention, we could bite and devour one another—and cancel out our collective impact. "1. Biblical guidelines about angels. Some people in the prophetic camp speak of frequent visits to heaven, “third heaven revelations,” and long conversations with angels who use names such as Emma, Promise and Winds of Change. Are these indeed spirits sent from God, or agents of false light? "2. A proper theology of the dead. Some in the prophetic camp claim they have had conversations with dead Christians — including Paul the apostle. Is this within the bounds of Christian experience, or is it necromancy? "3. Pastoral guidance about exotic spiritual manifestations. In some circles in our movement, unusual signs and wonders have been reported in church services—including the sudden appearance of gold dust, feathers, gemstones and oil. At the same time, worshipers are vibrating on the floor, jerking uncontrollably and acting intoxicated. How can we protect people from the abuse of manifestations, and from demonic influence, while at the same time leaving room for genuine encounters with God? "4. Clear guidelines concerning the restoration of fallen ministers. The appearance of one prominent fallen evangelist, Paul Cain, at the Lakeland Revival in May unleashed strong reactions from many sectors of the church. Many people feel unprotected when they sense that church leaders have chosen not to enforce proper discipline for a minister’s unbiblical behavior. In this adulterous generation, how can we draw lines to protect congregations while at the same time offer healing and grace to a repentant preacher? ANDREW AGAIN: After reading those last four points, all I can do is shake my head. Surely, Lee, you can see that if any movement has traits like those four at the center, then it simply HAS to be a dangerous deception? I mean, look at those four things again. Each of them is so serious that they are a major issue in themselves. And yet this movement has all four right at the heart! How can it be anything other than a deadly counterfeit? Is this the kind of revival we want in the Last Days? Is this what we want spreading around the globe? Your call for major leaders to come together and make a unified statement is admirable - except I have not come across any major leaders (apart from yourself) willing to actually warn of the dangers of this movement. And anyhow, where is the "middle ground" in this debate? I happen to believe this movement to be a deadly deception. Other leaders praise it as being a "great revival". How can there possibly be 'unity' between camps like that? Brother, the fact is that I believe God is calling YOU YOURSELF to be a "voice" for wisdom, common sense and discernment in these days - and to be totally bold, unafraid and uncompromising about it. Don't go looking for a "committee". You have a voice in the Charismatic community. Speak out! It is impossible to please everyone. Dear brother - please don't straddle the fence. What if this turns out to be one of the great Last Days deceptions and you spent all your time trying to be "moderate" and balanced about it? Speak boldly, let your voice be heard, make a clear trumpet sound. The Charismatic community needs you now more than ever, my friend. READERS - PLEASE FORWARD this MESSAGE to OTHERS. -------------------------- End of what I had written before in 2008. In the dream the Lord gave me, the two men could not really do anything about the evil they were both contending with. It wasn't shown that I could either. It was around this time that I had people e-mailing me with questions as to whether the meetings were evil or had evil in them. From the scene I knew the Lord had revealed to me there was a problem even though I had not attended the meetings. I knew it was the Lord’s judgement. As further evidence, a man wrote me and said that he had personally been under the same evil spirit (manifesting miracles, etc.) that Todd Bently was operating under. This man who wrote me was presently undergoing deliverance from Python and the evil spirit was easily recognizable to him after having been under the same spirit. He wanted me to know and I was thankful for the confirmation. All this reminds me of a scene of the devil sitting in a pew in a church service with His arms around the shoulders of the persons on each side of him. He had a big smile on his face, leaning back enjoying himself. It was not a pretty picture. One time years ago the Lord showed me that Satan had visited our meeting during a Pythonic eruption through a member here. Sometimes we get totally into spirits and forget it can be Satan himself performing things, as in Lakeland. (The church in the world needs to understand that Satan can visit every person on this earth in a 24-hour period, even though he is not omnipresent. See link He loves to go to church services as well as does Python. Learn about Python. I was looking at something I had done (what I had already written and brought together). It was gray in color and square. I saw a cable with at least 5 prongs being attached to it. It was obvious the head (male plug) of the cable had more places for more prongs. This cable was gold (in color) and looked to be over an inch wide. It reminded me of a path. This cable went to a bigger square or rectangular area that was golden also. In the scene I also saw a second cable that could be used that was gray, but not as long. It was like I had a choice between the two. 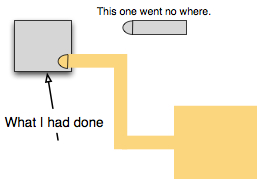 The gray cable did not go to a larger area like the golden one did. It was straight, short ,and ended up going nowhere. It was frayed out at the other end so it could hook to nothing. From the scene I knew the Lord wanted me to add to what I had already done and it needed to be about golden things. Later the revelation came. Suddenly I was understanding why the Lord showed me to burn the good and the evil together, which are found in the Lakeland meetings. This article was not to be centered on Python and the evil spirits in the Lakeland meeting, but on “revival” itself. The Lakeland revival had good and evil in it and even the good is far from the golden revival God is wanting people to enter into. When people entered into the Lakeland meeting they entered into self, evil occurrences, some good, but not in the Lord. Fire is representative of a cleansing. Even the good at Lakeland needed to be cleansed in the eyes of the Lord. In truth there would not be one element present in the Lakeland meeting that could appear in a Golden Meeting and have the meeting remain a Golden Meeting! Hence, we see why the Lord said to burn the evil and the good completely up. Sad, but true! The revival the Lord wants is to bring the church into Himself as His pure Bride. He wants intimacy with His people, only accomplished within the boundaries He already has presented (and demonstrated) on this site. The golden cord in the scene given on January 19th is representative of the Narrow Golden Path that leads to Brideship. 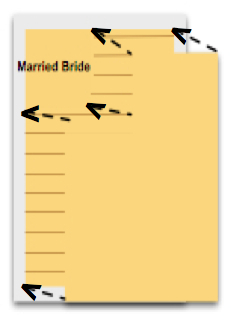 The way to Brideship is narrow and has changes of direction, as you can see in the picture given. The gold filled square in the picture, given on January 19th, that the Lord wants His people to come to, is the same square as shown in the picture (to the right) of moving from guests to Brideship. The Married Bride gold square is in the upper left corner. This picture is how the Lord showed us He wants the guests to move into Brideship. This information is revealed on the site. Do you/we want REVIVAL that lasts? Enter into the Golden path that leads to Brideship! Remember, the Lord told me to tell people to set their eyes on Brideship. If you do, you will have Entered into God’s Revival, which brings (develops over time) intimacy between the Lord and us!